Surely no stranger work exists in the annals of protest literature than The Master and Margarita. Written during the Soviet crackdown of the 1930s, when Mikhail Bulgakov's works were effectively banned, it wraps its anti-Stalinist message in a complex allegory of good and evil. Or would that be the other way around? The book's chief character is Satan, who appears in the guise of a foreigner and self-proclaimed black magician named Woland. Accompanied by a talking black tomcat and a "translator" wearing a jockey's cap and cracked pince-nez, Woland wreaks havoc throughout literary Moscow. First he predicts that the head of noted editor Berlioz will be cut off; when it is, he appropriates Berlioz's apartment. (A puzzled relative receives the following telegram: "Have just been run over by streetcar at Patriarch's Ponds funeral Friday three afternoon come Berlioz.") Woland and his minions transport one bureaucrat to Yalta, make another one disappear entirely except for his suit, and frighten several others so badly that they end up in a psychiatric hospital. In fact, it seems half of Moscow shows up in the bin, demanding to be placed in a locked cell for protection. Meanwhile, a few doors down in the hospital lives the true object of Woland's visit: the author of an unpublished novel about Pontius Pilate. This Master--as he calls himself--has been driven mad by rejection, broken not only by editors' harsh criticism of his novel but, Bulgakov suggests, by political persecution as well. Yet Pilate's story becomes a kind of parallel narrative, appearing in different forms throughout Bulgakov's novel: as a manuscript read by the Master's indefatigable love, Margarita, as a scene dreamed by the poet--and fellow lunatic--Ivan Homeless, and even as a story told by Woland himself. Since we see this narrative from so many different points of view, who is truly its author? Given that the Master's novel and this one end the same way, are they in fact the same book? These are only a few of the many questions Bulgakov provokes, in a novel that reads like a set of infinitely nested Russian dolls: inside one narrative there is another, and then another, and yet another. His devil is not only entertaining, he is necessary: "What would your good be doing if there were no evil, and what would the earth look like if shadows disappeared from it?" I read the Michael Glenny version in the late sixties, and have loved it deeply ever since. Having lent my copy to a friend I bought a new one some years ago - and I thought I would try the Richard Pevear and Larissa Volokhonsky version. This couple evidently know the nuances of Russian culture but they simply can't write idiomatic English and their translation therefore loses the spontaneity and fun of the Glenny version. 'What the devil does he want?' thought Homeless, frowning. 'And you were agreeing with your interlocutor?' inquired the stranger, turning to Homeless on his right. Yes, we're atheists,' Berlioz smilingly replied, and Homeless thought, getting angry: 'Latched on to us, the foreign goose"
'Ah, how interesting!' exclaimed the foreigner. 'What the hell does he want?' thought Bezdomny and frowned. 'And do you agree with your friend?' enquired the unknown man, turning to Bezdomny on his right. 'A hundred per cent!' affirmed the poet, who loved to use pretentious numerical expressions. Which version do you think would be more enjoyable to read....? I'm now looking for the Burgin/Tiernan O'Connor version so that I can read that to compare. Gloriously fun and funny novel, a real treat and change-of-pace. During Stalin's Soviet Russia of the 1930s, the rational and scientific take absolute preference over the intuitive and metaphysical, vast mechanisms are in place to hush up anything extraordinary or inexplicable, and aberrant citizens disappear mysteriously on a daily basis. What better place for Satan and his ministers to wreak supernatural havoc? The first half of the novel is dizzying and delirious, depicting the wickedly humorous exploits of the devil--in the guise of Woland, a black magician--and his unholy companions through the eyes of several average Russian characters. The second half zooms in on the title charcters, a sort of reversal of the Faust lovers, with young, beautiful Margarita seeking Satan's help to reunite her with her lover, a perscecuted novelist. Woven throughout the crazily uneven events of the main story are excerpts from the "Master's" novel manuscript, a demythologizing of the Pontius Pilate story. Master and Margarita was written by Russian author Bulghakov. It has been translated into English three times and is esteemed by many. It was filmed by Germans/Poles but I can't located. My mother had seen it and she things it's superior to the Russian epic. I enjoyed it very much. This version follows the original very closely but some parts are not included (so my mother says...she watched it in Poland). There are two strands throughout the story...Pontius Pilate's story and satire on Soviet life. It's hard for me to decide if someone who did not read the book and is not familiar with situation in Russia under Communism,can truly follow the gist of the story, bit I may be wrong. Since I read it in Polish, Russian, and the three English translation, I know the book by heart. Twenty years ago the sudden appearance of a nervous looking young security guard at the door of my office nearly gave me a heart attack. It was three in the morning, the hospital's ninth floor (the non-patient biophysics department) was otherwise completely dark and empty, and I'd been laughing so hard that I hadn't heard the security guard walk up to my door. When I looked up and saw him, the shock was like a cattle prod to the solar plexus. The guard also looked sort of scared - when he'd gotten off the elevator on what was supposed to be an empty floor, he'd heard hysterical cackling coming down a dark corridor and was torn between duty and just getting back on the elevator and pretending to have heard nothing. The reason for my hysterical laughter was this book. I'd sat down to read it after finishing some necessary tasks and before going out for dinner that evening, completely lost track of the time, and didn't go home until I finished it near sunrise the next morning. I loved this book. Twenty years and several reading later, I still love this book. By now you know it's a satire on Stalin's USSR. You may know that it juxtaposes Stalin's Moscow and Pilate's Jerusalem, that it's built around a book (written by the Master) within the book that takes on a life of its own until Jerusalem (the setting of the Master's book) and Moscow merge into one. The structure of the novel is ingenious and original. It follows the demented journey through Moscow of a bad poet (Ivan); the wild, cruel, and very funny escapades of the devil and his retinue (a giant talking cat, a lovely naked witch, a thug with one fang) as they turn Moscow upside down; the travails of a Soviet bureaucrat as he goes about trying to make a buck and get a better apartment; a dejected institutionalized author (the Master) and his devoted follower (Margarita); and the confrontation between Yeshua ha Nozri (Jesus the Nazarene) and Roman power in Jerusalem (Pilate). It ends for all its characters either in peace or in redemption or, in the case of a soulless Soviet editor, in nothingness. The satire is biting, but it loses something in an age when the average college student has at best a very dim memory of a place called the USSR. I strongly recommend that the reader who wants to fully enjoy the satire buy and read Sheila Fitzpatrick's book, _Everyday Stalinism_. Even the first couple of chapters of that book provide more than enough information to let one understand and enjoy Bulgakov's novel. With satire, context is everything, and context is often absent for post-Soviet readers. This book was just referred to me. "Without a doubt, the book in the original Russian is incomparable, but if you don't read Russian I would recommend the Burgin/Tiernan O'Connor translation. The first translation I ever read was Mirra Ginsburg's - although it is very charming and enjoyable, certain bits of conversation as well as almost an entire chapter are omitted from this translation. 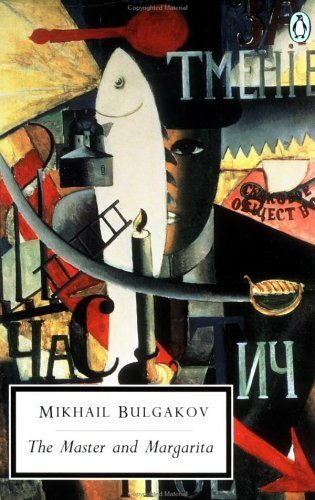 I have also read parts of Michael Glenny's translation, and I don't feel that his translation accurately relays the depth, rhythm and richness of Bulgakov's style. Burgin/Tiernan O'Connor has given the most complete and accurate translation of this work." Folks! There's an easy fix for this! Phantasmagorical - a hilarious and a ripping yarn. A Soviet mockery, tripping through the darkside of life - exploring the influences of evil and good, malice, mischief aforethought. All about hate and love, lies and truth, nihilism and anarchy - misplaced idealology. Wonderfully wicked and demonic, a well organized but chaotic read. Inspirational and inspiring in a boisterous romp. It's just a lot of fun - never boring. Burlesque - it's satire at it's best. a vindication and a celebration of the persecuted (metaphorically executed?) Russian intelligentsia clad in the revered garb of the Holy Fool; a hymn to the strength of the weak," writes Simon Franklin in the Michael Glenny translation Introduction. Hugh Aplin, in a newer translation, contends that, (p 433) "The novel demands several readings, such are the depths of interconnected details and implications." Following his advice, I've now read the book three times in as many months (Aplin's, then Glenny's, then Aplin's again). Each time I learned something new. As the story begins, two men, Mikhail Alexandrovich Berlioz, an editor, and Ivan Nikolayevich Ponyrev, a poet, are sitting on a bench in Moscow, discussing an anti-religious poem the latter wrote for the former, when, speak of the devil, he arrives, (p 6 HA) "A citizen almost seven feet tall, but narrow in the shoulders, unbelievably thin, and a physiognomy, I beg you to note, that was mocking." Intrigued by their contention that Jesus never existed, he places himself literally in the middle of the conversation, plunking himself down between the two and assuring them that the man did indeed exist. As the discussion and foreigner become increasingly animated, the Muscovites agitatedly realize that something is not right. He introduces himself as Woland, claims to be a "specialist in black magic," and correctly prophecies Berlioz' imminent and gruesome death. The poet, determined to track down the mysteriously murderous man, ends up in a sanatorium while Woland takes up residence in the deceased's flat. His new roommate is, conveniently, the manager of a local theater. When they first meet he learns (without prior knowledge or rememberance) that he has contracted with the devil to do a series of shows in the theater. The first performance, attended by over two thousand persons, is a hit. Meanwhile, in the sanatorium, Ivan meets The Master, so nicknamed by his lover Margarita, a woman who has left an idealic life and marriage as a result of her obsession with an article he's written about Jesus, to be, instead, with him. The two parties meet when the Devil's henchman, (p 90 HA) a "lanky man in broken glasses" solicits Margarita's services to hostess a wicked party. Lathered with a magical cream, she temporarily becomes a young witch, complete with a broomstick that allows her to fly (her maid Natasha does same and joins her). They, along with the Devil's henchcat ("black" and "large as a boar") terrorize the residents of Moscow for one horrible night while they entertain the spirits. Margarita chooses to be kind to a new acquaintance over asking for a reunion with her lover, but Woland ends up honoring both requests. The books... Truly they won't Burn!!!!!!?? This masterpiece has gained almost supernatural halo in Russia. Myth surrounds it like the one claiming the books would not burn if put to flame and rumors that attempts to make this book into into a play always end in disaster. Stalin and friends indeed tried to burn them metaphorically along with the Russian soul. They failed because in people like Bulgakov the flame burned too brightly to be extinguished. Master and Margarita puts Bulgakov in the front line of Russian literature (pretty impressive when you think that beside him you have Dostoyevsky, Chekhov and Tolstoy). It's true, you have to be Homo Sovietic (or preferably a Moscow resident) to understand the depth of the satire and wit poured from the Bulgakov's sharp pen. However, even without a Russian translator attached, this masterpiece is guaranteed to be one of the best books you'll ever read. There are actually three stories here - Satan and retinue of extremely funny subordinates (naked witch and talking cat included), are turned loose in Moscow and tear it upside down. In the background we have the true story (from the viewpoint of an atheist), of the meeting between Pontius Pilate and Jesus of Nazareth. Another story is the love between Margarita and her Master (Artist, writer of the Pilate-Jesus story). The stories intertwine, until finally the Master and Margarita win redemption from the hands of...Satan. The subtitle is a satire of how the totalitarian state treads on the soul of the artist. Events unfold at the speed of light, making this book hard to put down. The dialogs are simply too good to be true. Bulgakov has the sharp eye of Dostoyevsky when it comes to pointing human flaws, and boy oh joy, he can sure kick the human soul and bring all the ugliness to the surface. I can keep attaching superlatives, but none will do justice to this masterpiece, so I'll end with a plea. Please people - Read this book, you'll thank me later. The jewel in modern Russia's literary crown. The tyrannies of the 1930s and `40s were classics of the form - although reading Orwell's "1984" shows the terrifying possibility that more far-reaching totalitarianism could occur. In prewar Stalinist Russia, the alleged art of the state was "Soviet realism". Even the actual (and therefore anti-Soviet) artists of Russia occasionally felt the brunt of Stalin and his thugs - with results such as Shostakovich's intensely Stalinist (and therefore antimusical) "Hymn of the Forest". The dreary banality of all the arts under such antihuman regimes as Bolshevik Russia and Nazi Germany was almost beyond belief. Even so, flowers bloomed in the virtually sterile artistic soil of Stalin's Russia. Great musical talents such as Prokofiev and Kabalevsky - although no fans of their genocidal dictator - were able produce pretty much what they wanted because their styles tended not to offend Stalin and his cultural goon squad. Literature in the Soviet period suffered even more than music: Russia's greatest writers could publish their works, if at all, abroad. What the government allowed to be published were propagandistic (although not entirely hack) works like Shokolov's "Virgin Soil Upturned". Although the hack writers of the Stalinist period didn't lack talent, the really great writers of the Bolshevik state were obliged to work mostly sub rosa. From the 1920s to the end of his life, Mikhail Afanasyevich Bulgakov lived and worked within the Stalinist tyranny. Denied permission to emigrate and virtually denied permission to create, he lived unhappily until 1940 when he died prematurely of cancer. Paradoxically, Stalin was actually rather fond of Bulgakov, having seen and enjoyed one of his plays. Bulgakov died early enough to avoid Stalin's usual betrayal of nearly everyone he originally befriended (however marginally). The dictator died before he got around to Lavrentiy Beria and some others, but they were certainly on his list by that time. Even at that late date, more than a decade after his death, Bulgakov remained an obscure figure. His greatest work was not published in any form until 1966. This work is "Master and Margarita", one of a small handful of immortal novels produced within (and in defiance of) Soviet Russia - and possibly the greatest of them. The greatness of M&M is advanced by its universality. This is achieved by abstracting it to a large extent from the political reality of 1930s Moscow. While the novel paints a vivid picture of life in the Soviet capital, the Stalinist system is virtually invisible and its founder totally so. M&M could be taking place in the capital of any strongly centrist European state. It should be noted that many editions of M&M exist. The only one you will wish to purchase is this one (translated by Burgin and O'Connor). It is far above the others in the accuracy and felicity of its translation, not to mention its wonderful notes and analytical essay ("Afterword"). The "Master" of the novel's title is in many respects Bulgakov himself: a brilliant writer with little success at being published, whose masterpiece (a novel) seems condemned to nonpublication. The novel in this case is about Pontius Pilatus, the Procurator of Judea until mid-36 CE (the year in which Yeshua bar-Yosif ["Jesus son of Joseph"] was crucified). Some chapters of this novel appear in M&M, allowing the author to tie many elements of M&M together. Bulgakov is well versed in Gospel history, learnedly referring to Yeshua as "ha-Notsri". This term is frequently mistranslated as "the Nazarene" or "of Nazareth" (leading the author of "Matthew" of quote a probably nonexistent older text). It actually means "of the branch", from netser or nezer ("branch") - generally taken to mean a claimed descent from the very early Israeli king David. Bulgakov cleverly gives Pilatus a character that doesn't match what we know of him from Josephus. Similarly he gives us a different Yeshua and Yehudah ("Judas") than we would expect. The "Margarita" of the title, the Master's muse, is in some respects Bulgakov's 3rd wife (and also his muse), Elena Sergeyevna Shilovskaya. In terms of text devoted to her, Margarita is a far more important than the Master. The Master's story line in this work is reality mostly hers. Her name is an important clue to the novel as a whole. Marguerite (Margarita) is one of the names given to Faust's inamorata. In her passionate devotion to the Master, in her uncompromising and uncompomisable innocence, Margarita is a dramatic picture of Marguerite - but more real and compelling than the portraits of Goethe and Gounod. In a literary sense, Margarita as a shadow of Marguerite, just as M&M is a shadow of the Faust legend. The trinity Faust-Marguerite-Mephisopheles brings us inevitably to the protagonist (dare I say hero?) of M&M, Woland. His name, founded on the German for "where? ", raises instant questions about where he is actually from and, consequently, who he actually is. That he is the "devil" of New Testament legend becomes quickly and readily apparent. He begins his visit to Moscow by going after a number of unsavory individuals. That they are of little consequence is a necessary reflection of the fact that going after people of real consequence would have landed Bulgakov in a non-mythical hell thanks to Russia's non-mythical devil (Stalin). That Woland's real mission is salvation - at least of Margarita and the Master - will seem far-fetched to the reader until it actually happens. The question is whether that mission was deliberate - for as Goethe says of his devil, "That Power I serve ... wills forever evil yet does forever good." More accurately in M&M, Woland's mission seems to be insuring that evil begets evil and good begets good. Woland in turn is part of yet another trinity: himself, Behemoth, and Korovyov. Behemoth ("the Beast", one might say) appears mostly in the form of a 6-foot upright cat. Korovyov is more human in form but just as obviously a demon. This trinity turns parts of Moscow upside-down through the use of particularly bizarre pranks. (It might be observed that the prominent presence in their company of an owl and a mirror suggests "[Till] Eulenspiegel", another famous prankster.) The merriment begins almost at once with the death of the unpleasant Rimsky, run over by a streetcar. The image of his head, rolling kabumpty-bumpty-bump down the street is hilariously macabre. Much of the novel is full of this trinity's high-jinks. I'd have to reread the novel with a mind to make notes in this regard, but I suspect that other trinities appear with some frequency in M&M. As the pranks in Moscow wind down, the story shifts gears to focus on the adventures of Margarita with Woland and his entourage. There is a grand ball that takes place in an impossibly large space. This is a reflection of Dante Alighieri's "Inferno". There is then a witch's Sabbath in a remote location. This Faustian episode is accompanied by another, a wild ride on black horses, that appears again at the end of the novel. Throughout, as earlier, it is Woland who guides and directs the activities. Finally, it is Woland, saying he does so at the request of Yeshua, who arranges the salvation of the Master and Margarita. Bulgakov - who has been standing things on their heads throughout the text - thus ultimately stands Christian mythology on its head. It is one of his greatest achievements that he uses the Master's novel and his own novel's ending to add a deep and refreshing humanity to hoary and less human New Testament myths. M&M has lent several sayings to popular Russian culture. Most important of them is the non sequitur, "manuscripts don't burn". In the novel, the Master burns his novel, just as Bulgakov burned the original ms. of M&M. The phrase comes from Woland, but magically produces the Master's ms. Bulgakov, on the other hand, re-transcribed his work from memory. The problem here is, and Bulgakov certainly knew it, that manuscripts do burn. If that were not so, we should now be able to purchase a CD of Sibelius' 8th Symphony. Still, it's amazing how many musicians and authors have left posthumous instructions that certain mss. should be burned, only to have people with a better grasp of reality refuse to burn them. Bulgakov's incomparable novel ends in a chapter of ravishing prose, of which I would like to quote a small paragraph. "'And there too," said Woland, pointing backward. `What would you do in your little basement?' The fragmented sun dimmed in the glass. `Why go back?' continued Woland in a firm and gentle voice. `O Master, thrice a romantic, wouldn't you like to stroll with your beloved under the blossoming cherry trees by day and then listen to Schubert by night? Wouldn't you like to sit over a retort, like Faust, in the hope of creating a new homunculus? Go there! Go there! There where a house and an old servant already await you, where the candles are already burning, but will soon go out because you are about to meet the dawn. Take that road, Master, that one! Farewell! It is time for me to go.'" Are you tired of Russian novels where people are slaves to horrible jobs and then die terrible depressing deaths? Mikhail Bulgakov's masterpiece is unlike anything else you'll ever read. It's a story of theology, government, fantasy, and love. I bought this book here after getting two independent recommendations and seeing it mentioned in another book about Russia. As mentioned by others, the satirical humor about fatalism and the all out battle for class being fought on a square foot by square foot basis in the "classless" society of the Soviet Union is priceless, even to someone who has no first hand knowledge of the society. The foibles of bureaucracy is a universal theme. Fun had by the devil knows who! This is like Dante's Inferno meets Monty Python. This is like Hellraiser meets The Marx Brothers. This is like Milton's Paradise Lost meets The Far Side. It is also one of the funniest and best novels I have read in a long time. Every chapter is abounding with clever quips, absurdist action, and poignant observations. There is a great literary observation going on here on what makes an artist suffer for his art. Another: What is art considered by those in leagues with government control? It also makes you think about the value of good and evil, and why we are so bent on considering one thing evil and another good with punitive absolution. It shows situation as being more complicated than anything really is. And to say that the Devil is an evil thing...well, in this book, it seems like both an overstatement & oversimplification. OK. Now that I've calmed down, I will continue. "The Master and Margarita" is the kind of book Lewis Carroll might have written had he been trapped in Stalin's Russia during the Terror. It masterfully (pun intended) treads the line between pointed satire and outrageous imaginative invention without ever descending into whimsy. Pretentious and boring, too clever for its own good, the only good chapters in this book are the ones about Pontius Pilate and Jesus Christ, and there's not enough of that. Getting used to all the "three-barreled Russian names" as other reviewers have stated, is probably the trickiest part of this classic novel! The author calls characters by their 1st name, then later refers to the same character by his middle and last name, a little confusing at times! This book has two parts, Part 1 is 168 pages, Part 2 is around 140 pages. Part 1 for me was a little boring, with the exception of the chapter "Black Magic and Its Exposure". Part 2 is where the book really picks up and turns into a real page turner! "Satan's Great Ball" is arguably the best chapter in the book! Before writing a book review, I always attempt to determine what the intent of the author was and how successfully the desired effect was achieved. So what, exactly, is the purpose of Bulgakov's "The Master and Margarita?" Is it to satire the literary intelligentsia of the Soviets? Is it to criticize the over-regulation and policies of the government? Is it to bash the atheistic policy of the state? Is it to provide an insightful account of Pontius Pilate and the crucifixion? Is it to reveal the vanities and greed of money inherent in society as a whole? Or is it simply to provide a humorous tale of the shenanigans of Satan incarnate and his demonic entourage? The answer, of course, to all of these questions is yes. "The Master and Margarita" is an enigmatic, unique, and even bizarre novel at times, that will challenge the reader. At first, the intent of Bulgakov is not entirely clear, as the first chapters detail the strange (and seemingly unrelated) tales of ordinary Muscovites and their encounter with an enigmatic foreigner, Woland, and his interpreter and talking black cat. Interspersed in this tale of Stalinist Moscow is the seemingly unrelated (and misplaced) story of a guilt-ridden Pontius Pilate and the crucifixion of two thousand years prior. The third subplot, and a link between the first two, is the story of the "master", an author whose book about Pontius Pilate was widely criticized by the literary Soviet elite, and his vivacious and adulterous lover, Margarita. Bulgakov does not directly bash the atrocities of the Soviets and collectivism, but through his interrelated tales, he paints a subtle criticism of the institutions and ideals of the Soviets. The fact that his tale (albeit embellished) of Pontius Pilate and the crucifixion is given as fact, this would, of course, directly counter the official state's atheism. The emphasis on official documents and passports provides a window into the life of a Muscovite, for if there is no official document, then that person does not exist. This is not a novel that should be read piecemeal, as it is best to read it in large sections at a time. The chapters alternate between characters (and millennia) frequently, as a link does not emerge until later. Since this is a Russian novel with a large cast of characters, the names can certainly be confusing and intimidating to keep straight. Overall, I was initially perplexed at the complexity of the novel, but as it progressed, it become more enjoyable. I stopped every ten minutes to exclaim, "Genius!" Needless to say, those around me weren't too happy with me the day I read the oh-so-genius "The Master and Margarita". I'm trying to remember the last time a book influenced me this much and made me realize its genius halfway through and laugh hysterically throughout appreciatively. It was probably "Don Quixote", which we all know is a simply brilliant book. "The Master and Margarita" surpassed even that in terms of genius. For instance, chapter 13: "Enter the Hero". 120 pages into the book, Bulgakov introduces readers to the central characters for whom the book is named. The important characters until then remain major, however it becomes clear that the story is not, in fact, about them at all. What other book can start with the whimsically titled "Never Talk to Strangers" chapter, go on to talk about devils, evil black cats with guns, witches, and dying in order to be happy? Never has a book about evil been quite as enjoyable. "The Master and Margarita" is a perfect example of where the central characters you grow to love are remarkably evil, if amusing, awkward, and perfectly human (despite not being human by any means). One of my favorite moments is when one of the devil's lackeys complains about being forced to do a task he feels is better suited to another lackey. One can't help but love the panic and chaos left behind by the devil (though he is only officially declared to be the devil late in the book, it is clear throughout, not least by the revealing back of the book...). The back of the book is strangely revealing (as are the reviews), but strangely, it's not the plot that drives the novel (though it certainly makes it more enjoyable). Clever writing, good storytelling, fabulous characters and characterization, and the most brilliant moments in literary history that I've encountered in my life, "The Master and Margarita" can be summed up in one simple word that I've definitely overused in this review: Genius. This is one of the greatest novels of the 20th century. A grandson of Faust and an ancestor to the Tin Drum, the 100 Years of Solitude, the Midnight's Children, the Wind-up Bird Chronicle... And surely Mick Jagger must have read it before Beggars' Banquet! Written and set in Moscow during the Stalin time, but published only in the 60s, posthumously, it ought to have far more attention than it gets. In Germany, it has just been re-published in a series by Der Spiegel, including bestsellers from the last 40 years. It was a bestseller when it came out, and ought to stay in print. It is not an ephemeral phenomenon. With sympathy for the devil, we watch mayhem spreading in a dictatorial setting which has no place for non-doctrinarial goings-on. They need the devil to tell them that Jesus existed. The devil shows up as a professor for black magic. He uses the name Voland, one of his names in Goethe's Faust. He dislocates Moscow's social life endlessly. The resulting extravaganzas are masterfully subversive and anarchic. On a second level, a Jesus story is told, a kind of Voland Gospel. Bulgakov introduces himself as the 'master', residing in a lunatic asylum, very appropriately, the author of the gospel. A highly entertaining masterpiece. My friend Giordano Bruno may be interested, from a musician's point of view, that two supporting characters are called Berlioz and Strawinski. And Johann Strauss gives a cameo appearance. I have not yet figured out what that means. Reading the other reviews, I feel as if I'm going to be sent to the Devil for not bowing down before it-But let's not suspend all our (God-given?) critical faculties before what is, I agree, a magical, unique book.---This sort of literary sycophancy is just the sort of thing Bulgakov skewers herein. To begin, the book has a deft, light rapier wit one does not associate with other dark, gloomy Russian writers of the Gogol and Dostoeyevsky School. It is jolly fun to read. And the satire on totalitarian states and the writing establishment-PEN members take note!-is quite beyond compare. But no work exists in a vacuum. One of the other reviewers mentions that this is the sort of book Lewis Carroll might have written had he lived under Stalin's totalitarian regime-Quite-Through the Looking Glass is this book's clearest literary predecessor, only, as novelist Malcolm Lowry might have put it, in Bulgakov "there are depths." "Gods, my Gods! How sad the earth is at eventide! How mysterious the mists over the swamps. Anyone who has wandered in these mists, who has suffered a great deal before death, or flown above the earth, bearing a burden beyond his strength knows this." P.321, in my edition. This passage, I think, gets to the heart of what Bulgakov is about here. But still, how mysterious the mists hang over this book! And who has the power to dispel them? And why am I only giving this book four stars instead of wailing at Amazon to provide me six? The Devil only knows.